Varialena, Varialena (2001) Dinamika emosional dan proses penyesuaian diri perempuan yang bercerai karena penganiayaan suami. Skripsi thesis, Universitas Tarumanagara.
" Variety of researches reported that women who experienced domestic violence and got divorced tended to experience psychological or emotional problems following their divorce. The problems are associated with child rearing, household activities, financial matters, social relationships as well as sexual matters. Some researches mentioned that these women started to learn to get adjusted after they got divorced. However, other researches reported that many of them had prepared themselves during marital separation prior to divorce. This research was aimed at finding the emotional dynamics and adjustment process of the women prior and after their divorce. Four women (aged27-40) participated in this research. This research used qualitative approach, and data collection was conducted by using depth interview. Results indicated that all subjects felt sad and disappointed for having a divorce. They also experienced stress, fear and anger due to the fact that they were abused by their husbands, yet felt lonely and experienced feelings of loss ever since they got divorced. 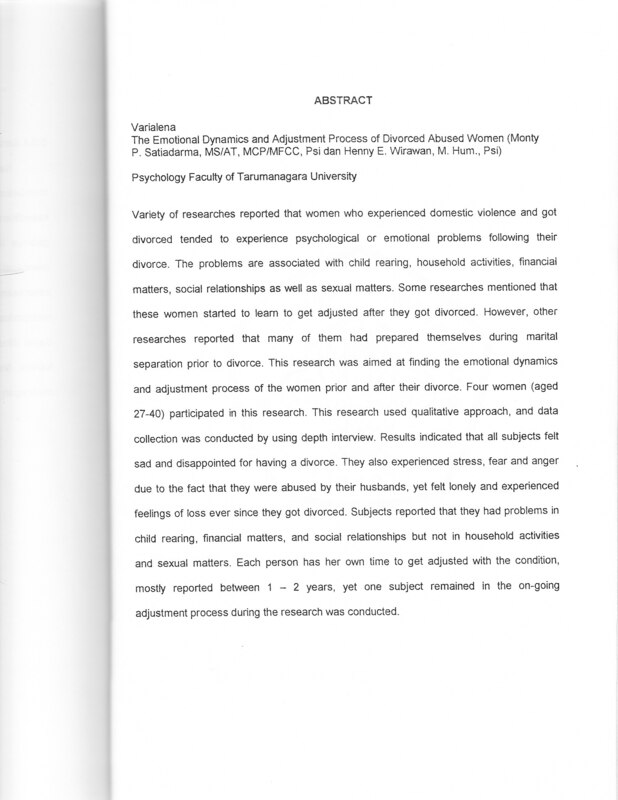 Subjects reported that they had problems in child rearing, financial matters, and social relationships but not in household activities and sexual matters. Each person has her own time to get adjusted with the condition, mostly reported between t - 2 years, yet one subject remained in the on-going adjustment process during the research was conducted. "